On the summer feast day of St. Benedict, Patron Saint of Europe, Fr. 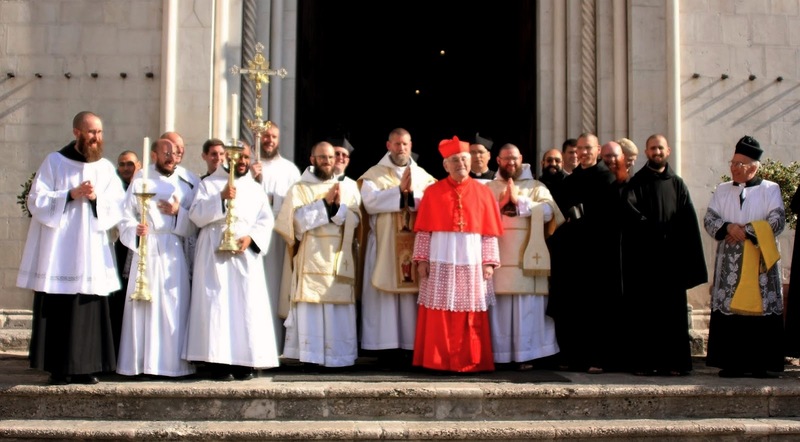 Cassian Folsom has answered a few questions for the organizers regarding the meaning of the venue in Norcia of the Populus Summorum Pontificum for the opening of its 5th international pilgrimage (October 27-30, 2016). Click here for more information about the visit to Norcia scheduled as part of the pilgrimage. 1) Dear Father, this October, the fifth pilgrimage Populus Summorum Pontificum will begin its path towards the tombs of the apostles from Norcia. What does that represent for you and your community to welcome such an initiative? Fr. Folsom: The monks of Norcia are very happy to welcome the 5th international pilgrimage Populus Summorum Pontificum. It is good for all of us to return to the sources of our faith, and praying at the shrine of saints is a good way to do that. In addition, the monastic community was inspired by Pope Benedict’s motu proprio, as you all were -- and we are grateful to God that we can offer the Conventual Mass in the Extraordinary Form every day. For these reasons our monastery, at the birth place of Saints Benedict and Scholastica, is a logical destination for your annual pilgrimage. We are honored that you have chosen to come to Norcia. 2) The pilgrimage will be led by the archbishop of Portland (OR), the Most Rev. Alexander K. Sample. How important is it to see local pastors celebrating “in utroque usu” as you do in Norcia? Fr. Folsom: While the Conventual Mass is celebrated in the Extraordinary Form, we also offer Mass in the Ordinary Form in the local parish, and with pilgrim groups who request it. In 2009 the Ecclesia Dei Commission entrusted to us the special apostolate of celebrating the Eucharist in utroque usu so as to be a sign of unity in these times of frequent division. In some countries, it is very common for a parish to offer Mass in both forms every Sunday. I am always edified when I visit such parishes, and I admire the bishops who promote the richness of our liturgical tradition. 3) Europe is in a very difficult condition since the denial by its leaders of its common Christian roots. What should Catholics ask and pray St. Benedict for? Fr. Folsom: Yes, many leaders in Europe are very reluctant to acknowledge the Christian roots of this continent. This does not come from an objective observation of European culture and history but from an ideological point of view. St. Benedict is often admired by everyone, including secularists, for his contribution to Western civilization. But the cultural contribution of monasticism is a secondary by-product, not a primary goal. The primary goal is the worship of God, and the real motto of St. Benedict is not “ora et labora” but “prefer nothing to the love of Christ.” We need to ask St. Benedict for a double share of his spirit.